What Are the Benefits of Sauerkraut Juice? Sauerkraut and its juices are made from naturally fermented cabbage. In this ancient method of food preservation, dry salt is added to shredded cabbage, which causes the cabbage to release juice containing lactic acid, preserving the cabbage. Although they can be high in sodium, both sauerkraut and sauerkraut juice are linked to several healthful benefits. Commercially made sauerkraut and its juice are also available in low-sodium varieties. Sauerkraut juice, due to the fermentation process, is rich in natural lactic acid, which inhibits the growth of undesired intestinal bacteria and encourages the growth of good bacteria. This makes sauerkraut juice an excellent choice for treating sluggish bowels and poor digestion. Drinking this tart juice not only benefits your body's digestive process, but it also acts as a laxative, helping to prevent constipation. Your body relies on potassium, an essential mineral, for important functions, including carbohydrate and protein metabolism and muscle contraction. An article published in "Physiologia Plantarum" in August 2008 noted that clinical studies show a high-potassium diet lowers blood pressure, not only in people with raised blood pressure but also in the average population. In addition, a high-potassium diet was credited with reduced deaths from cardiovascular disease because of its blood-pressure-lowering effect. Increased potassium intake also lowers calcium loss through urine, which may play an important role in the prevention of kidney stones and may reduce the risk of osteoporosis. A 1-cup serving of sauerkraut and its juice provides 401 milligrams of potassium, which is 12 percent of the daily value. Sauerkraut juice provides vitamin C, an essential component of your body's connective tissue and a powerful antioxidant. Antioxidants are substances that help protect your body from free radicals, unstable molecules that can damage cells. An article published in "Archivos Latinoamericanos de Nutricion" in March 1983 noted a study that was conducted to determine whether cabbage lost vitamin C content during the natural lactic acid-fermentation process. 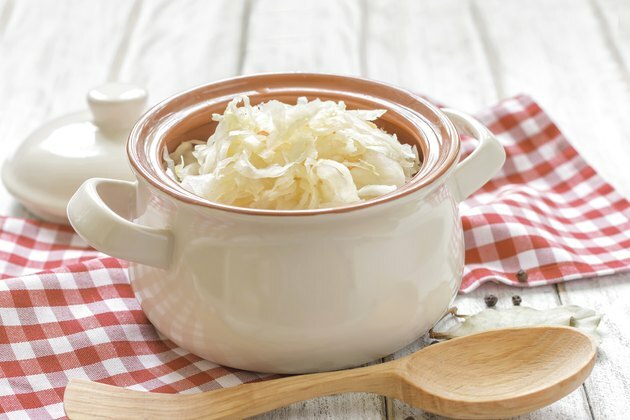 The study revealed that the fermented cabbage retained between 61.9 percent and 100 percent of its vitamin C. A 1-cup serving of sauerkraut with juice contains 34.7 milligrams of vitamin C, which is 58 percent of the DV. Iron is a mineral that's essential to life. It's crucial for proper oxygen transport and aids in the regulation of cell growth. Many of your body's proteins and enzymes rely on iron for proper functioning. Without sufficient iron, your cells receive insufficient oxygen, which results in fatigue and reduced immune system response. An article published in "The Journal of Allergy and Clinical Immunology" in June 2005 noted that a lack of adequate micronutrients, which includes iron, can lead to significant immune deficiency and infections in children. A 1-cup serving of sauerkraut with juice contains 3.47 milligrams of iron, which is 19 percent of the DV. Natural Stomach Care; Anil Minocha, M.D. Frostburg State University: Inorganic Chemistry: Why Is Potassium Necessary in the Diet?